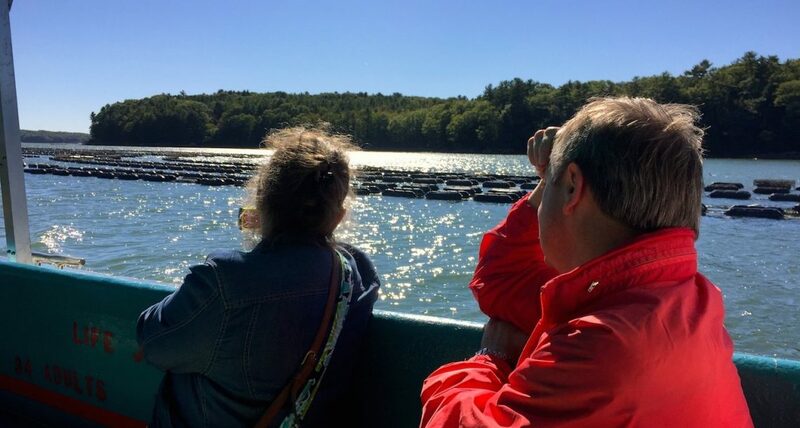 The Oyster Farms & Fall River Tour takes in the Damariscotta River’s wildlife and its new role in oyster farming, that makes this tidal river world famous. We will sail by seven oyster farms that raise these very tasty bivalves, and find out how oyster farmers prepare the farm equipments and sow the the world-famous Damariscotta River oysters in the fall, while bald eagles, ospreys and migratory birds hover around. Captain Chip will regale you with local history, natural lore, and pass by Maine’s oldest wooden-boat builder in operation. You can purchase the famous shellfish from Olga’s Raw Bar onboard and pair them with a delightful, heartwarming fall drink. All wildlife (and oyster farmers) are curious and photogenic, regardless of their age! The trips are partially narrated. Educational and fun for the whole family!